Our Offshore Construction and Subsea Services provide complete offshore construction and installation works for offshore platforms, submarine pipelines and Subsea facilities, Umbilicals, Risers and Flowlines (SURF). Our Transportation and Installation (T&I) services include heavy lift, pipeline installation, jacket launch, floatover and deepwater projects. We also provide offshore diving and related underwater works including the design, manufacture and operation of Remotely Operated Vehicles (ROVs) through to the decommissioning services of offshore facilities. 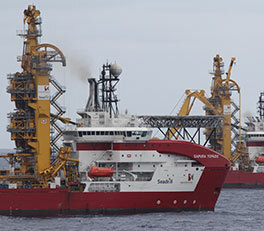 Sapura Energy draws from over three decades of experience at differing water depths and environments to provide efficient subsea engineering and construction services. We offer innovative solutions from Front-End Engineering Design, commissioning, the subsea market both in shallow and deepwater with our scope ranging from full Engineering, Procurement, Construction, Installation and Commissioning (EPCIC), to transportation and installation services for subsea facilities. Subsea structures, manifolds, riser-bases, protection structures, etc. The execution of our projects are strongly supported by our own fleet of strategic vessels providing shallow water, deepwater, flexible pipelay, umbilicals, heavy lift, floatovers, transportation, diving and specialised services around the globe. Our markets span Southeast Asia, Australia, India, China, Russia, Mexico and Brazil. We believe in providing a cost-effective solution to clients and with full control of our strategic fleet, we are able to provide our clients with the right assets at the right time around the globe.